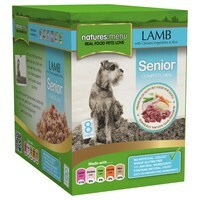 Natures Menu Senior Dog Food Pouches (Lamb with Vegetables) has been prepared from whole cuts of Lamb, Chicken, fresh vegetables and wholegrain rice in a complete and balanced recipe suitable for senior and resting dogs. Made with a high content of real meat, each pouch has been filled with top quality raw ingredients and then steam cooked once to ensure the nutrients stay locked within the product. The minimum processing keeps them as close to a dog’s natural raw diet as possible. Chicken is a delicious light meat that is an easily digestible protein that contains many B vitamins and useful amounts of Iron, Zinc, Phosphorous, Selenium and Potassium. Lamb is a complete protein and has a unique fat content; half the fat (around 60%) is the healthy unsaturated type which is good for the body.